The Calcutta Massacres of 1946, also known as the “Great Calcutta Killings,” were four days of massive one sided massacres in Calcutta the capital of Bengal province of pre-1947 India, resulting in 5,000 to 10,000 dead, and some 15,000 wounded, between August 16 and 19, 1946. These massacres are probably the most notorious massacres of the 1946-47 periods, during which large-scale violence occurred in many parts of India. However, the Great Calcutta Killings stands out somewhat in the history of Calcutta, given that it was by far the most deadly episode in the recent history of the city. Although it received its name very soon after the events, it remains a very controversial episode, and different views or interpretations of it were put forward from Britain, India, Pakistan and Bangladesh. While there is a certain degree of consensus on the magnitude of the killings, including their short-term consequences, controversy remains regarding the exact legacies of events, various actors’ responsibility, and the long-term political consequences. This paper is intended to throw light on the dreadful consequences the migrant Bangladeshi Urdu Speaking and Bengali Speaking communities have been suffering even now. The event must be situated in two different, yet interrelated contexts: firstly the all-India context, and secondly the Bengal one. The former was marked by growing tension between the Congress Party, the Indian organization with a base mostly (but not exclusively) among the Hindu population of the country, and the Muslim League, the main organization representative of the Muslim minority, which comprised almost 25% of India’s population. Tensions were largely due to the fact that both groups were gearing up for a transfer of power from the British, which Prime Minister Clement Attlee had announced in March 1946, without fixing a date, however. Each group had very different ideas regarding the future shape of the subcontinent. In 1940, the Muslim League passed a resolution in favor of the creation of Pakistan. It was not clear, however, whether it was meant to be a separate Muslim state or a part of a confederation with the rest of India (Ayesha Jalal, 1985). The British colonial authority is believed to have hoped that a partition of India could be avoided and were trying to come to an agreement with both the Congress and the League. In a statement on May 16, 1946, a British Cabinet Mission proposed a plan for the formation of an interim government composed of representatives from the Congress, the League, and other forces. This plan gave the Congress one more seat than the League. But After weeks of behind-the-scene negotiations, on July 29, 1946, in protest of Jawahar Lal Nehru’s ‘statement’ the Muslim League adopted a resolution rejecting the May 16th plan and called on Muslims throughout India to observe a “Direct Action Day” in protest on August 16. 1) Gandhi’s opposition led the Indian National Congress to reject the British offer. 2) Cripps’ modification of the original British offer, which provided for no real transfer of power. 3) The behind-the-scenes efforts of the Viceroy and Secretary of State for India to sabotage the mission. Gupta concludes that documents released in 1970 support the third interpretation. Messages between Viceroy Lord Linlithgow and Secretary of State L. S. S. Amery reveal that both opposed the Cripps Mission and they deliberately undercut Cripps. While the British government utilized the Cripps Mission as evidence of its liberal colonial policy, personal and private correspondence reveals contempt for the mission and elation over its failure. The situation in Bengal was particularly complex. In the province, Muslims represented the majority of the population (54%, as against 44% of Hindus) and were mostly concentrated in the Eastern part (present-day Bangladesh). As a result of this demographic structure and specific developments, this province was the only one in which a Muslim League government was in power (under a regime of provincial autonomy introduced in 1935), in coalition with Europeans, and in the face of strong opposition from the Congress Party and from a Hindu nationalist party. The latter, the Hindu Mahasabha was supported by many members of the rich Marwari trading community, composed of immigrants from Rajstan, who largely dominated the economy of Calcutta and of Bengal (although European capital was still important). The leader of the Muslim League in Bengal and Chief Minister of the province was Hussain Shaheed Suhrawardy. Suhrawardy was idolized by many Muslims in Bengal, particularly by the Urdu-speaking Muslims from Northern India, who formed the majority of Calcutta’s Muslim population (Bengali Muslims, who accounted for the bulk of the Muslim population in the province, were mostly concentrated in the countryside). Calcutta itself had a clear Hindu majority (73% of the population according to the 1941 Census) and a significant Muslim minority (23% of the population). Given the tendency of the population in urban areas to congregate in neighborhoods dominated by one community, most Muslims lived in areas of Northern Calcutta, while Central and Southern Calcutta were almost exclusively Hindu (with a sprinkling of Europeans). Another characteristic of Calcutta’s Muslim population was that it was largely composed of poor people, mostly artisans, factory workers, rickshaw pullers and domestic servants. The Muslim middle class in Calcutta was small, in contrast to the much larger Hindu middle class. Big Muslim merchants and capitalists were few, and could not compete with the rich Marwari Hindus. Although Muslims were clearly a minority in Calcutta and occupied a peripheral position in the economic, social and cultural life of the city, the capital was the only large city in the province, and therefore occupied a privileged position in all provincial politics, whether Muslim or Hindu. Suhrawardy had a particularly large following amongst the poor Muslims of the city. Jinnah had called for peaceful demonstrations all over India on Direct Action Day, and most of India, including the Muslim-majority provinces of the Punjab and Sind (in the latter the Muslim League was part of a coalition government) remained calm. In Bengal, however, and specifically in Calcutta, the events took a violent turn, and quickly spun completely out of control. Controversy still rages about the respective responsibilities of the two main communities, the Hindus and the Muslims, in addition to individual leaders’ roles in the carnage. The dominant British view tends to blame both communities equally and single out the calculations of the leaders and the savagery of the followers, amongst whom there were criminal elements (Tuker, 1950). In the Congress’ version of the events (Bose, 1968), the blame tends to be squarely laid on the Muslim League and in particular on the Chief Minister of Bengal, Suhrawardy. The view from the Muslim League side, nowadays partly upheld in Bangladesh, the successor state to East Pakistan, is that in fact Congress and the Hindus used the opportunity offered by Direct Action Day to teach the Muslims in Calcutta a lesson and kill them in great numbers (Rashid, 1987). Thus, the riots opened the way to a partition of Bengal between a Hindu-dominated Western Bengal including Calcutta, and a Muslim-dominated Eastern Bengal (nowadays Bangladesh). There is an explicit accusation in pro-Congress accounts (partly upheld in British sources) that Suhrawardy’s attitude overtly incited violence. The accusations regarding Suhrawardy’s inflammatory language cannot be substantiated. The main accusations leveled at Governor Burrows in pro Congress accounts are: 1. that he allowed Suhrawardy to interfere with law and order operations while his reserve powers allowed him to prevent Suhrawardy from doing so; 2. that he took too long to realize the extent of the trouble, and called the troops in when things had already gotten out of hand; an earlier intervention by the military might have been able to save the day. 2. that he called the troops in as soon as he had enough of them available to make a difference. Their exact number is not and will never be known. Authorities have compiled various official estimates on the basis of a rough body count. The most widely accepted figure of dead is situated between a minimum of 5,000 and a maximum of 10,000 (Joya Chatterjee, 1991), and the number of wounded is generally put at around 15,000. The massacres in Calcutta links with a widely accepted, very important point: according to most accounts the majority of the victims were Muslims. 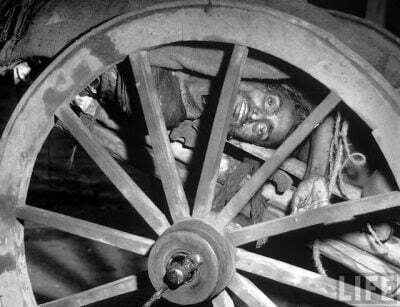 Since most Muslims in Calcutta were poor, there seems to be a certain coincidence between the religious and the social content of the massacre. Few rich Hindus or Muslims appear to have been targeted, although Muslim crowds attacked the houses of some rich Hindus, from which their owners hadabsconded. Thus, the massacre could be described as the combination of one large pogrom against poor Muslims by Hindu thugs. A number of people must also have been killed in the crossfire between the two communities, and quite a few killed by police and Army fire, adding to the complexity of the massacre. Ironically, one could say that on the one hand, the Great Calcutta Killing is very much an object of living memory; narratives are handed down from one generation to another within practically all the families who lived through it. On the other hand, it is conspicuously absent from the official memory of Bengal, particularly on the West Bengal side, but also, in a more surprising way, on the Bangladeshi side. Given the lack of study on this aspect, one can only point to some of the possible reasons for the absence of an official memory of the Great Killing. On the Indian side, political expediency is the most plausible. In regard to the Hindus, who had had the better in the fight, they found it preferable to adopt a low profile and to play the apparent appeasement card. On the Pakistani side, the question was complicated by the fact that, from the early 1950s onwards, a small section of Dhaka based middle class Bengalis in East Pakistan felt increasingly alienated from their West Pakistani compatriots and were nostalgic for the time when Bengal had been united. Therefore, they were not interested in reviving old wounds. The same attitude persisted in 1971 after Bangladesh was born with the help of India. Although there was a change of regime in 1975 and a worsening of relations with India, there was no significant attempt at creating a memory of the 1946 killings. Thus, there was a kind of conspiracy of silence which only began to be lifted in the 1990s, when the advent of a new historiography in India led to reconsideration of a whole part of the Indian past, that had previously been believed to be better off forgotten. Yet the Great Calcutta Killing, (the expression most often used) remains a marginal episode in the dominant narrative of the history of Bengal. A court on Wednesday ordered the Netherlands to compensate the families of more than 300 Bosnian Muslims killed after Dutch troops handed them over to Bosnian Serb forces in 1995, in a ruling that could make countries such as Canada more leery to contribute troops to peacekeeping missions. The civil court in The Hague cleared the Netherlands of liability in the massacre of nearly 8,000 others, saying that although those people sought protection in the UN safe haven of Srebrenica, they were never directly in the custody of the Dutch troops. The court ruled that the Dutch peacekeeping troops could have protected the 300-plus men and boys who were among thousands of Muslims – mainly women, children and elderly people – taking shelter in a Dutch compound inside the UN-declared safe haven of Srebrenica. Moreover Britain also has compelled to pay the compensation to the Mau Mau Torture Victims of Kenya. Britain was to pay out £19.9m in costs and compensation to more than 5,000 elderly Kenyans who suffered torture and abuse during the Mau Mau uprising in the 1950s, the foreign secretary, William Hague, had said. Hague told the House of Commons that the payment was being made in “full and final settlement” of a high court action brought by five of the victims who suffered under the British colonial administration. Italy also paid $5 billion as compensation for colonizing Libya. Italy agreed to pay Libya $5 billion as compensation for its 30-year occupation of the country, which ended in 1943. On 30 August 2008, Gaddafi and Italian Prime Minister Silvio Berlusconi signed a historic cooperation treaty in Benghazi. Under its terms, Italy would pay $5 billion to Libya as compensation for its former military occupation. “In this historic document, Italy apologizes for its killing, destruction and repression of the Libyan people during the period of colonial rule.” and went on to say that this was a “complete and moral acknowledgement of the damage inflicted on Libya by Italy during the colonial era”. Citing all these references can’t we settle that the Victims of the Great Calcutta Killings deserve compensation upon the same grounds as well as International Laws that were used by all those nations mentioned above? Three issues are to taken into account for Breaking the Silence after Decades. 1. The politicized narratives regarding the The Great Calcutta Killings has corrupted the popular mindset of both in West Bengal and to some extent Bangladesh. The state of Bangladesh and her intelligentsia have a suprising bias of putting special emphasis on all Indian narratives generated mostly just in the form of propaganda which resulted in the general public some form of a sense of ignorant guilt .Therefore, to get rid of communal maladies for good, we need to search for the correct history. 2. Since the beginning of the genocide on August 16, 1947, refugees from West Bengal started coming towards what is now called Bangladesh. During those days two-thirds of the Muslim population of Calcutta was Urdu-speaking. Initially the Muslims from Calcutta and after them scores of thousands of other Urdu-speaking people, who fell victim to the massacres of then Bihar were forced to take shelter in this country. The biological descendants of these Urdu speakers have been forced to live as a Stateless Population like Palestinians in Bangladesh! Like the Palestinians of West Bank and Gaza, all Bangladeshi regimes consider the Urdu Speaking Minority as the “enemy within” and keep them terrorized by using the security apparatus! 3. According to international law, the offenses committed after the Second World War are considered to be in the nature of Crimes Against Humanity that were deliberately committed as part of a widespread or systematic attack or individual attack directed against any civilian or an identifiable part of a civilian population. For this reason, in response to the petition filed by only 5 members of the Kenya’s Mau Mau tribe, the British government had to accept the charges of committing genocide and pay compensation to the victims. Through this process, the British government not only has been forced to confess their crimes but also end the hegemony over Kenya for good. 4. Following the example of Kenyans, Bangladeshi victims can file a lawsuit in the British court against the British state and India seeking compensation for the loss and damage caused by the Great Calcutta Killings and the Bengal Famine of 1943. If so is done, both Britain and India will be forced to undergo a process of domestic change and end their dirty policies over the world. Especially China, Russia and Turkey can initiate this process. 5. The International Trial of the Perpetrators of the Great Calcutta Killings may be the starting point for the re-establishment of democracy and the people’s rights both within the state of Bangladesh and at the international level. 6. Considering the case of democracy and people’s rights, the civil society of Bangladesh should be vocal about the trial of institutional killers of Great Calcutta Killings and Bengal Famine. The Indian Origin Urdu Speaking Minority Council Bangladesh has been working on the goals mentioned above. 2. Ayesha Jalal (1994). The Sole Spokesman: Jinnah, the Muslim League and the Demand for Pakistan. Cambridge U.P. p. 47. ISBN 9780521458504.